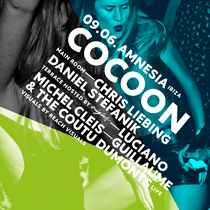 Cocoon is back for the second summer party at Amnesia this coming Monday. After the madness of last week’s opening, Sven is having a week off, leaving Chris Liebing and Daniel Stefanik in charge of the Main Room. On the terrace, Luciano is going back to his roots, hosting the first of his eight Origins parties. Joining him will be two of Cadenza's finest acts, Michel Cleis and Guillame & The Coutu Dumonts. Cadenza Music boss Luciano returns to Amnesia on the 9th of June with his new project, Origins. Presenting a plethora of big name DJs, each event will represent the true commitment and dedication to the underground music scene. Luciano will headline each of the eight dates. Pushing into its 11th year throwing parties in Ibiza, the Cadenza family's latest project will represent an accumulation of his time on the island, focusing on the minimal sound he is known for. First to support Luciano is Michel Cleis. Known for his eclectic style and diverse taste for melodies and warm grooves, Cleis' hit 2009 track 'La Mezcla' quickly made him a fixture on the house circuit worldwide. Citing Luciano's support of the track as integral to its success, this collaboration at the launch is a testament to the great relationship between the two. Providing another helping of groove-induced techno is Guillaume & The Coutu Dumonts, who completes the opening line up. Guillaume has a rich and varied history of music experience that is reflected in his sound. A highly accomplished producer with a multifaceted list of ventures under his belt, expect a high energy from the Canadian.